Iron Mountain MI UP Olympic Ski Jump Slide 1930s RPPC LL Cook C-1693 Unsent, photo by UpNorth Memories – Donald (Don) Harrison. With the Winter Olympics just around the corner, it’s a good time to look back on the history of skiing. I’m guessing many folks aren’t aware of the pivotal role that Michigan has played in the history of skiing. A great place to start is the U.S. National Ski and Snowboard Hall of Fame and Museum in Ishpeming. It’s the only hall of fame in America dedicated exclusively to skiing and boasts 20,000 square feet that are packed with cross-country, downhill and snowboarding exbibits and memorabilia to take you from the founding of skiing to the latest innovations. The core of the hall are the 368 inductees who represent some of the great names in skiing history. Included in their ranks are a number of Michiganians from one of the most influential ski resort owners in the nation, Everett Kircher (who developed the double and triple chair and made numerous other innovations at Boyne Mountain) to Lansing native and world class racer Cary Adgate (whose daughter is currently tearing up the slopes in Northern Michigan). …The first actual recorded tournament in the Midwest took place in St. Paul, Minnesota, January 25, 1887. Starting from a tower all of twenty feet high, the Norwegian champion Mikkel Hemmestveit went 60 feet in the air to win. Then Hemmestvedt and his brother Torjus took the sport west to Red Wing, Minnesota with an exhibition tourney on February 8, 1887, sponsored by the year-old Aurora Ski Club of Red Wing. That very year, the idea of jumping spread to the Upper Peninsula and Ishpeming soon became a particular hotbed of jumping culture. In the Upper Peninsula after 1900, any town aiming to rank as a place worth living in had at least one big jump trestle. It became a matter of civic pride. The movement was supported by generous donations from the Upper Peninsula mining companies. Along the entire peninsula, ski clubs were founded, copying the organization of earlier Norwegian ski clubs the immigrants had known in their homeland. In Ishpeming, dozens of small backyard jumps were fashioned out of the plentiful snow and a few larger ones were built from trusses of native iron. The Ishpeming Ski Club was organized in 1887 as the Norden Ski Club. A year later, it changed its name to Den Nordiske Ski Club (the Nordic Ski Club) to reflect its ethnic makeup. Business during club meetings was mostly transacted in Norwegian. Then diversity set in. With the arrival of Finns, the name was changed in 1901 to the Ishpeming Ski Club and meetings were thenceforth conducted in English. From that came a gradual growth toward the birth of organized skiing and, eventually, the founding of the U.S. National Ski Hall of Fame. 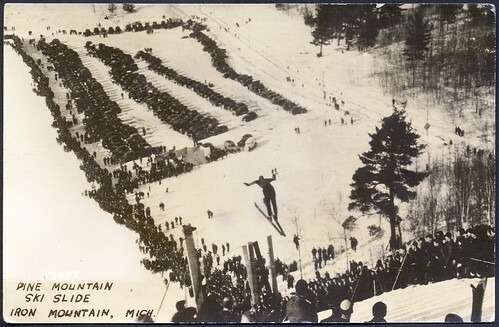 Definitely click through to their homepage – there’s an awesome ski history video there – and if you want to know more about ski jumping in Michigan, the Detroit News Rearview Mirror has a cool feature on Michigan’s long history of ski jumping with some great old photos! The photo above from Pine Mountain is one of countless postcards featuring Michigan’s rich history available from Don Harrison. Be sure to check it out bigger or in his ski slideshow (which leads off with a postcard of the jump they had in Ishpeming).